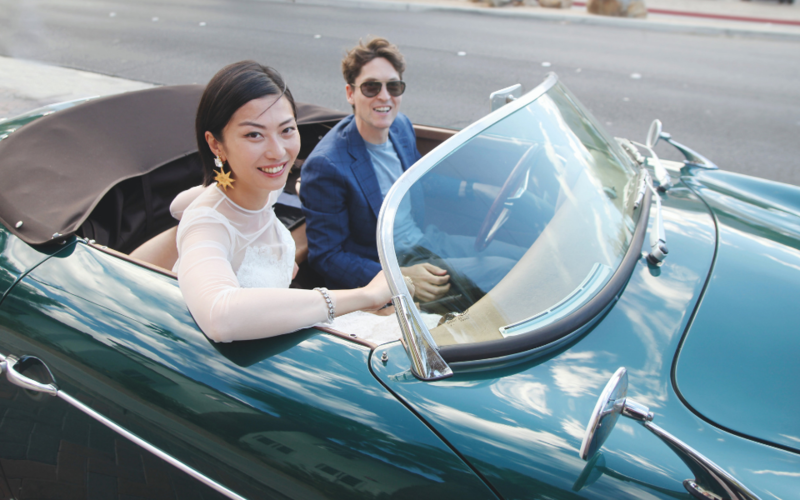 Laura Cheung and James Wolf wed in a wildly creative Palm Springs ceremony that melded Old Hollywood charm with eclectic chinoiserie decor. This is one wedding not easily forgotten. If you’ve ever set foot in the creative interior design and furnishings den that is Lala Curio in Wan Chai’s Sau Wa Fong, you’d know not to expect a typical white wedding from its owner, Laura Cheung. There’s a veritable treasure trove of curiosities and an almost theatrical aesthetic inside the much-loved artisans’ paradise that champions the march-to-her-own-beat founder’s personality. It was therefore unlikely that Laura’s wedding to beau James Wolf would have been run-of-the-mill in any sense of the phrase. This was a ceremony filled with colour, verve and personality—and just a small dash of circus-style hijinks—at Cary Grant’s estate in Palm Springs, California. Laura and James first met at a dinner party that Laura threw at the Happy Valley racecourse. James had set his eyes on Laura then, but she was unavailable. However, the timing worked out better for the couple a few years later, when they bumped into each other at brunch. While Laura played matchmaker, James saw this as the perfect opportunity to start a courtship, a race that took him around the world from Hong Kong to Macau, Okinawa, and New York City. The proposal came three years after the couple got together, while they were on a hike up Mount Hinode in Tokyo. “I was hungry and grumpy and was like 'Why are you making me walk so far?'" says Cheung. "But on the top there was a stunning view and he proposed. I had a can of sake, so I popped the sake and went 'Yeah!'" See also: We Asked: What's Your Proposal Story? Laura had plenty of event-planning experience from her days working in New York in the fashion industry and she knew exactly what she wanted, so the couple hired a planner simply to make the magic happen. Guests dined on tacos as they waited for a performance by a mariachi band… which never showed. Luckily, though, unbeknown to the bride, her girlfriends had a surprise performance planned, doffing their pre-bridal best in favour of T-shirts and jeans for a choreographed dance to hit song Despacito. The next morning, Laura had close personal friend Phil Blandow take portraits inside and around the estate before the tea ceremony with the family and then, later on, during the exchange of vows. Laura’s father walked her down the aisle as her bridesmaids sang Can’t Help Falling in Love. At dinner, the couple walked in and were greeted by an explosion of confetti before a DJ-violinist, who was perched three storeys high and balanced on a sway pole, played a rousing set that had guests old and young beaming with surprise and excitement. As a health nut, James ensured all the food was organic and locally sourced, and the menu noted which farms the produce hailed from. The couple’s friends at Smyle Foods made healthy paleo gluten-free desserts—so there was no cake. “We didn’t want anything too conventional,” says Laura.